Will he stay? Will he go? 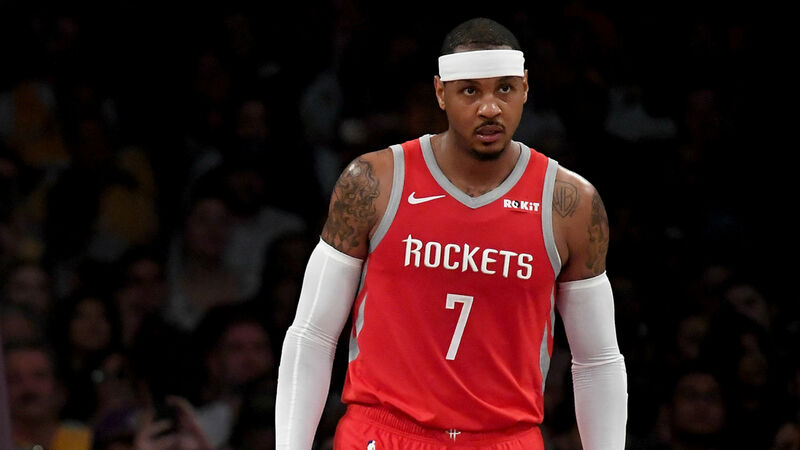 It’s not news that Carmelo Anthony and the Rockets are in talks with his role in the organization and whether or not he will stay in Houston. But a recent development suggest he’ll soon be exiting. However, Houston strongly denies the report. Owner Daryl Morey said the rumors were unfair before the Rockets face the Pacers Sunday night, a game Anthony will not participate in due to illness. — Tim MacMahon (@espn_macmahon) November 11, 2018 ” rel=”noopener noreferrer” target=”_blank”>told reporters. “He’s been great with us, as coach (Mike D’Antoni) said yesterday, he’s approach has been great, he’s accepted every role coach has given him — starting, off the bench, whatever it’s been. Morey also added he expects Anthony to be playing as soon as he is healthy. Houston has been struggling as of late, losing two consecutive games after a three-game win streak. The Rockets sit at 4-7 and are fourth in the Southwest Division. Anthony has played in all but one game, but he’s only started twice. He’s averaging 13.4 points in 29.4 minutes of action.